The Molo Fondo is for beginner or intermediate cyclists who are just starting their season and know the basics of riding in a group or peloton. 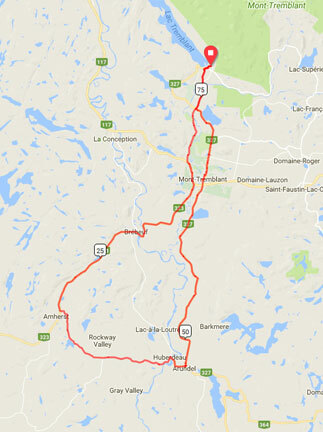 Participants will have the leisure to enjoy the beauty of the surrounding scenery as they journey along Mont Tremblant’s road network. The peloton goes through Mont-Tremblant’s old village, Brébeuf’s splendid fields, and across the famous covered bridge. If this is your first Gran Fondo experience, you will definitely enjoy this challenge, which combines pleasure and safety. Note: The average speed is a reference and will be adapted to the pace of the majority of the group. "See the course details on "Ride With GPS""
The Medio Fondo is suitable for intermediate cyclists, or advanced cyclists who are just getting into their season. This course offers scenic views of the Laurentian landscapes over an 80-km loop that runs alongside rivers, fields and farmland with breathtaking views of Mont Tremblant. This 80-km ride is similar to the 125 km in that it does not include the challenging climbs yet still delivers an exciting experience. An ideal opportunity for cyclists who wish to familiarize themselves with a Gran Fondo as well as riding with a group. Note: Several average speeds are proposed to meet all levels of cyclists. Choose yours wisely and keep the course elevation in mind. The Gran Fondo is a 125-km loop designed for experienced cyclists who seek a personal challenge in a ride that takes them through the rolling landscapes of the Upper Laurentians. The cyclists will take Montée Ryan, then pedal past the picturesque settings of Brébeuf and St-Rémi d'Amherst, to continue along Rockway Valley’s Hwy 364, which boasts a superb riding surface. The loop crosses the villages of Huberdeau and Arundel before going through downtown St-Jovite. 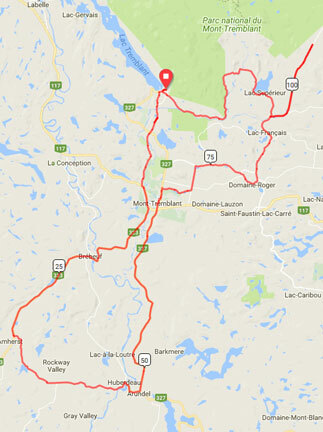 After crossing eight municipalities, cyclists will tackle a section of the legendary Nordet, a mountainous road between Lac Supérieur and Saint-Donat. Riders end the journey on the sinuous and fast chemin Duplessis, which connects the North and South sides of Mont Tremblant. The Super Fondo 160 km is designed specifically for experienced cyclists who enjoy a more demanding long-distance challenge. This course takes riders on a long-distance ride with an elevation of over 1,600 meters. 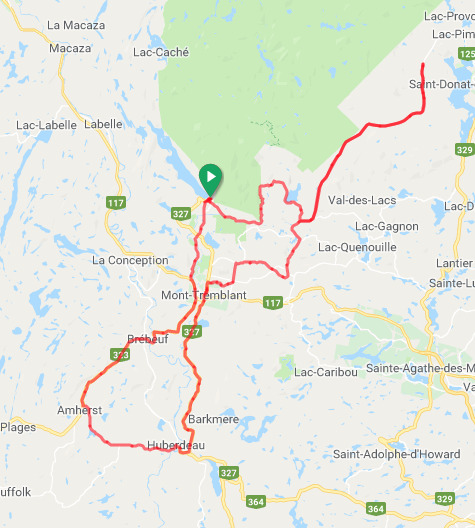 The route is similar to the Gran Fondo 125 km but adds an substantial section of the legendary Nordet, a mountainous road linking Lac Supérieur and Saint-Donat. A favourite with the athletes amongst us; nothing compares! In the last portion of the ride, be prepared for some challenging uphill stretches on an impeccably paved surface, followed by long, high-speed descents.